No matter the time of year, it’s always nice to be tanned and feeling your best! Even if summer isn’t around the corner, there is always the possibility of being invited to an indoor pool party or going on a vacation to a sunny, warm beach. You don’t want to look like you’ve been hiding out indoors, drinking hot chocolate all winter, do you? We’ve compiled a well-researched list of the best tanning oils out there on the market today, so you don’t have to. Now, all you have to worry about is, which bathing suit are you going to wear to match your perfect tan? Take a look at the table below to determine which tanning oil or lotion is the best fit for you. We’ve made it easy to compare and contrast, so you can spend your time working on your bronze instead of on the computer! Here are the best tanning oils for 2019. According to Livestrong.com, tanning oils have benefits like hydration, protection against the sun, and more. The top tanning products on the market vary widely, so it’s important to determine your preferences, and compare from there. Let’s look more in-depth at each product and answer any questions you may have about them. What do you think of when you think of Australians? Perhaps the words “daredevils”, “charming accents”, and “surfing” come to mind. The word “tan” probably does, too, right? 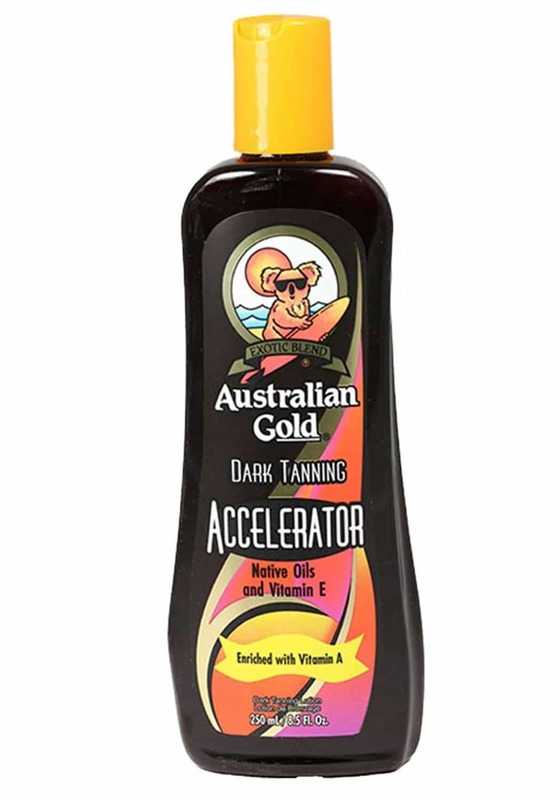 Gold Coast residents sure know what it means to be bronze, and the Australian Gold Dark Tanning Accelerator spray lives up to its name well. It’s one of the best tanning oils of 2019, in fact. This easy-to-apply spray ensures the application is even and doesn’t leave any patch of skin out of the bronze club. Its Biosine Complex contains Olive Oil, Tea Tree Oil, and Provitamin B5. The complex provides skin with essential vitamins and emollients, enriching skin and ensuring its health while under UV rays. Vitamins A and E also assist in this, making sure there is minimal cellular damage, preventing wrinkles that can come from tanning. The indoor/outdoor tanner also contains moisturizing ingredients which instead of dehydrating the skin, leave it silky smooth. Hawaiian Tropic represents the epitome of “tan and bronze”. Its Dark Tanning Sun oil does just that, through its skin-enriching antioxidants and natural oils. The oils keep your skin supple and ready for the sun, making sure dry skin is a thing of myths. Vitamins A, C, and E help protect your skin against harmful rays, which means less wrinkle-causing cellular damage. The oil’s coconut scent makes you feel like you’re really relaxing on a Hawaiian island, sending your mind on a calming vacation. The oil absorbs quickly, minimizing messiness, and is lightweight and long-lasting. No one likes the feeling of a heavy, slick oil on their skin, with every grain of sand sticking to them! This oil will feel like it’s not even there; if not for the coconut/tropical scent, you’d probably forget. One downside to the product is that it can clog pores and cause breakouts to those with more sensitive skin, especially if applied to the face and neck area. 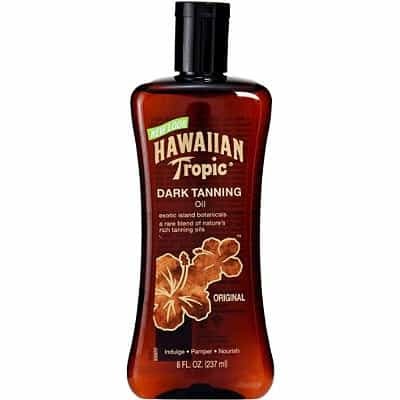 Overall, the Hawaiian Tropic Dark Tanning Sun oil does a great job as a lightweight, long-lasting tanning accelerator. 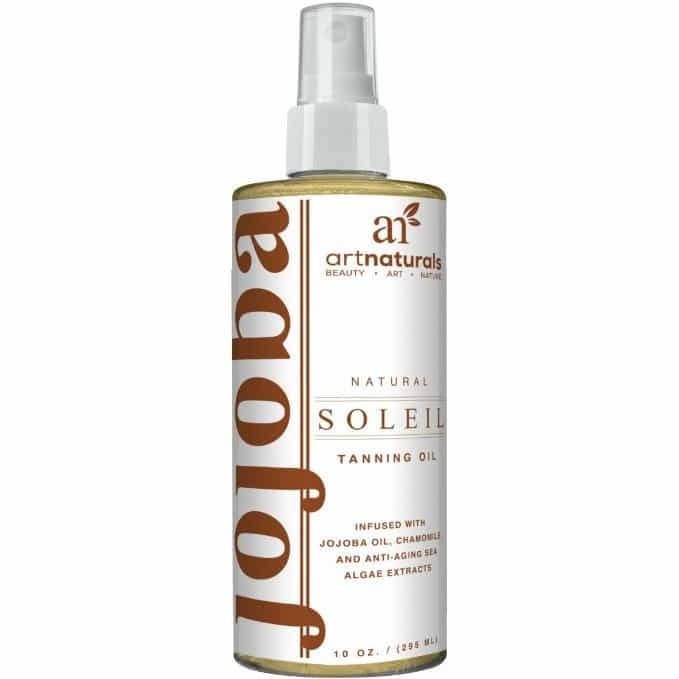 Art Naturals has really changed up the tanning oil game with their Protective Body Tanning oil that appeals to just about anyone who cares about the health of their skin and wants to maintain a golden glow, too. 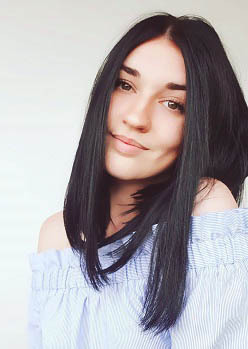 Its original intent was to be used solely as a method to achieve a dark, rich tan, but it soon came to surface that it was also amazing for maintaining the youthfulness and health of the skin. 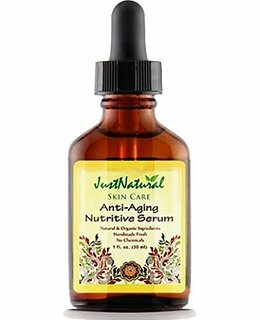 It boasts 13 active ingredients: safflower seed oil, coconut oil, avocado oil, jojoba seed oil, walnut seed oil, hazel seed oil, rice bran oil, are just a few of them. With all of those oils, it’s easy to see why your skin will be baby smooth after just one use. Not only do they protect the skin from harsh rays, but create a luminous glow even if you don’t plan on going out in the sun. In fact, many use it in ways other than as a tanning accelerator. For use after a shower, it acts as a supreme skin hydration, and it can help seal the effects of self-tanner while providing a radiant finish. With the inclusion of green tea extract and sea algae, it has the opposite effect of many other tanning oils on the market. Instead of clogging pores, it protects against free radicals and clears skin. The addition of coconut oil not only moisturizes but tightens and firms the skin. Oh, and to top it all off, it’s vegan, so anyone can feel good about using it! The downside? Some users reported the spray top not working after a couple of uses, due to the serum-like oil being thicker. The Maui Babe Browning lotion is one of the best indoor tanning lotions available today. The browning lotion makes it easy to achieve a deep tan in a short amount of time, so you look better in a shorter amount of time. It’s made from an “old, secret family formula”, so they don’t tell us exactly what is in the product, but we can tell you, it works. It does have aloe in it, which is great for protecting skin against the sun, and keeps you feeling fresh. You know that burning feeling when you’re laying in the sun and it feels like you may just melt into your towel? 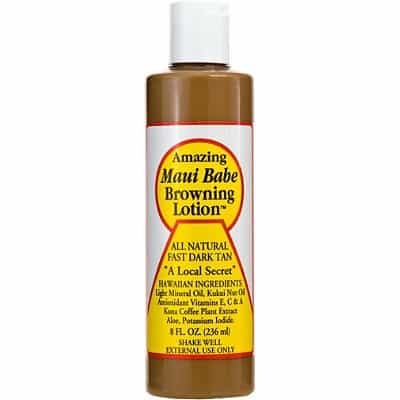 The Maui Babe Browning Lotion eliminates that and actually moisturizes skin, instead. An additional benefit that we think everyone will like, is that it is water-resistant and wards away insects. It can be used on even the lightest and most-sensitive skin types, and can be paired with sunscreen, should you desire. It can also be very greasy, which can stain clothes until they’re washed and can also clog pores. The Body Nutritive Moisturizer is another tanning oil that has made their mark by coming out with an all-natural product proving you don’t need man-made ingredients to achieve an impressive tan. Many serums are known as being heavy and greasy, but this one is lightweight and absorbs quickly than others, to help moisturize and leave your skin feeling healthy. The addition of avocado, kukui nut, and peach kernel oils assist in hydration, leaving skin more supple than it was before use. Its oils promote smoothness, as well as elasticity. It can even help eliminate breakouts on the skin, and clear pores, as opposed to clogging them like many other tanning oils do. This natural tanning recipe is truly outstanding if you tend to have sensitive skin that is easily irritated. 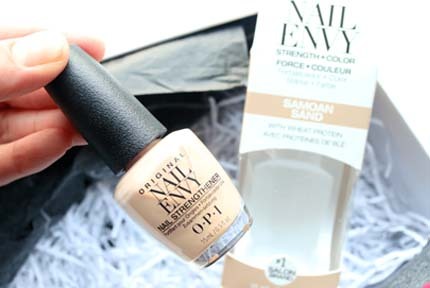 The product is made in the US, uses no chemicals nor parabens, and is also a vegan product! The one negative aspect of the product is that some found its nutty/coffee scent unappealing. 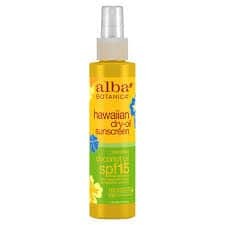 Alba Botanica’s Hawaiian Sunscreen is not only gluten-free but also biodegradable, so you don’t have to worry about harming the environment when you’re done with the bottle! With coconut oil, shea butter, and vitamin E, you can be assured your skin will not only be well-hydrated but feel more tight and supple after use! It also offers something many other tanning oils don’t which is additional protection against the sun, SPF 15. Their products are not tested on animals and is completely vegan. This makes things easier for vegetarians who also want to get a nice glow going. For those with allergies or sensitive skin, this tanning oil has no parabens, phthalates, or synthetic fragrances. The “dry oil” is much less greasy than regular oil, which is a great innovation in any tanning oil. Being greasy and slick is never a nice feeling when you’re just trying to relax in the sun! The product does separate if not shaken or used regularly, and it is not vegan, so keep that in mind as well when comparing products if that is something that’s important to you. Tanning oils are a way to give yourself a good-looking, natural tan without having to damage your precious skin and health in the process. Tanning oils can be used in indoor tanning beds or outside on the beach, to accelerate your tan and give a deeper hue to your skin. They are very different from sunscreen. Many with lighter or more sensitive skin can burn if they do not add sunscreen in addition to their tanning oil, or use a tanning oil with at least an SPF of 15. The wrong tanning oil can cause dry, flaky, or burnt skin, or even just poor tanning results. This is why it’s so important to choose the correct oil that suits you. Oil, serum, lotion, or spray? Tanning oils can come in any of these forms. Oils are different than lotions, in that they sit on the skin, reflecting light, while also drawing in the sun’s rays. Oils can often be greasy and some of them can stain clothing if you don’t allow it adequate time to dry before putting your clothes on over it. Oils are simply poured on and rubbed in. Sprays can be more convenient as you won’t have as much of a mess on your hands, and it lowers the risk of the product spilling everywhere. A dry tanning oil will leave less residue on your hands and skin, which means less greasiness. If you’re using indoor tanning beds, dry tanning oil is a great option because it can be easily wiped off of the beds after use. Each product will offer a different level of color, such as “Dark” or “Extreme Dark”. Tanning lotions also give you a variety of color options, but the verbiage is a bit different. You’ll see something like “30x”, “45x”, or “100x” on the bottle. Each number represents the speed of acceleration for a darker tan. For example, if you want the deepest tan, then you should select the “100x” bottle. With lotions, no matter the packaging, you have to apply it by rubbing it into your skin. Tanning oils can come in a variety of scents, but there are a few out there with no artificial scents or no scent at all. The most popular scent for tanning oils is coconut, but many other tropical scents as well to make you feel like you’re away on vacation or an exotic island. A good oil should include natural moisturizing agents, such as coconut oil or aloe. The more natural the ingredients are in the product, the better it’s going to mesh with the skin which means less greasiness/messiness. In addition to the feeling, the more natural the product, the less likely it is to irritate the skin and cause breakouts. Also, make sure to check the SPF level on tanning oil bottles. They can range anywhere from 0 SPF to 30+, and it’s important to get the SPF level that is right for you. While you want a great tan, you don’t want to damage your precious skin in the process. While we’ve listed the best tanning oils out there for you, many are not a “one-size-fits-all” product. One did come very close, though. Art Naturals Protective Body Tanning Oil could pretty much do no wrong. In fact, the only possible downsides to the product were that sometimes the serum-like oil made it difficult to use the spray top, and the herbal/spa scent of the product did not impress some consumers. With its combination of over 13 active ingredients, including a plethora of oils from nature, this oil makes sure your skin is not only protected but actually is healthier than before. With it acting as a great moisturizer for after showering or for deepening your tan out in the sun. The addition of sea algae and green tea protects your skin all day from free radicals and helps to clear up any breakouts you may have. Rather than irritating the skin, it babies it, increasing its elasticity and preventing cellular damage. This product can be used by vegans as all of the ingredients come from nature. Even the most delicate of skin can use Art Naturals, without worry of an allergic reaction or clogged pores. Go ahead and give it a go!